City manager Simon Davies is hopeful that both Ryan Lowe and Eddie Johnson will be fit for tomorrow’s League Two game at Exeter City after both picked up injuries in the midweek win over Brentford. Shaun Kelly has recovered from a back injury but Laurence Wilson is unlikely be risked as he only started back in training this week. Glenn Rule sits out the game as he serves the last of his three match ban tomorrow. The Grecians will be looking to bounce straight back following a shock 6-1 home defeat by Chesterfield on Tuesday. They currently lie in fifth spot helped by an impressive away record that has seen them record five victories away from St James Park as opposed to two at home. 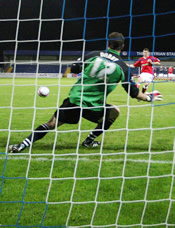 The two sides last met in April 2004 when the Blues won an exciting game 3-2 at Deva Stadium in front of the SKY TV cameras and a crowd of just over 4,000 – Chester supporters being allocated both ends of the ground on the day. It has been reported in the local press that striker Paul Taylor, who had his contract terminated by the club last week, failed a random drug test carried out by the Football Association on 6 October. Taylor was one of four players selected for the test. Chester signed the Vauxhall Motors 21-year-old striker on a six month loan deal on 1 July. The move was due to become permanent during the January transfer window with a reported fee of around £30,000 being paid to the Motormen. It remains to be seen if the player appeals against the findings of the drug test. City will be looking for a repeat of this form on Saturday when they make another long trip this time to Devon to play Exeter City. The Grecians suffered a surprise 6-1 home defeat at the hands of Chesterfield last night. Chester entertain Brentford at Deva Stadium tonight looking to record their second home win of the season. The Bees are currently flying high in second place in League Two and have won twice and drawn three games on their travels so far this season. Blues manager Simon Davies is expected to keep faith with the side that turned in an improved performance at Gillingham on Saturday despite the 2-0 defeat. Glenn Rule once again misses out through suspension while Laurence Wilson, Stephen Vaughan, Shaun Kelly and David Mannix are all sidelined through injury. Tonight’s game will kick-off at 19:45hrs. City have been given a home tie to League One side Millwall in the first round of this season’s competition. The game will take place on Saturday 8 November with a 13:00hrs kick-off. The two sides have met each other in the competition before back in the fourth round in 1979/80 when Chester beat the Lions 2-0 at Sealand Road in front of a near 8,000 crowd with goals from Trevor Storton and Ian Rush. The last time City and Millwall played each other was in the 1981/82 season. It has been announced that the game will be all-ticket for Millwall supporters. Chester fans can pay on the gate as usual. Chester have now gone seven games without a win following Saturday’s 2-0 defeat at Gillingham. The scoreline flatters the home side though as City battled well and dominated for game long periods keeping the home side quiet and restricting them to just one real chance in the opening 45 minutes, a shot from Mark McCammon that was superbly saved by John Danby. Ryan Lowe, Eddie Johnson and Kevin Ellison both saw chances go begging as the Blues failed to convert their first half dominance into goals. The breakthrough came for the home side midway through the second period when they scored twice in a four minute spell through on loan Tottenham Hotspur players, Andy Barcham and Leigh Mills. There was no way that the Blues were going to come back after that double. The youth team suffered a 3-1 defeat at Walsall on Saturday. Chester have terminated the contract of 21-year-old on-loan striker Paul Taylor for breech of contract. Earlier inthe month the club revealed that the player had been given a third and final disciplinary warning. It was reported then that the forward, signed on loan from Vauxhall Motors, had been missing training sessions and had twice pulled out of matches at short notice saying he was ill. Fans traveling to Gillingham tomorrow can save £2.00 on their admission by pre-booking direct from the home club. The Gills ticket office number is 01634 300000 (option #3). The full pay on the gate price is £20.00, the discount price is £17.00 + £1.00 booking fee. Defender Shaun Kelly is fit again and could return to the starting line-up tomorrow as the Blues meet Gillingham. Laurence Wilson is still sidelined with an ankle ligament injury and Glenn Rule starts a three match ban following his red card at Spotland. Chester have gone seven games without a win and tomorrow’s task against a side just out of the play-off positions is a tough one. The Gills have won four and drawn one of their six home games this season and have nine more points that the Blues. The Kent side will be without the services of captain Barry Fuller who is suspended. For the second time this season Chester conceded six goals on their travels. After Dagenham’s opening day salvo Rochdale took advantage of the ten man City side, and, but for a series of John Danby saves the scoreline could have been worse than the 6-1 final outcome. Few players came out of last night’s match with any credit and even City’s goal came from a Dale player as Rory McArdle headed into his own net following a Ryan Lowe free-kick to make he score 2-1. City were already a goal down when young defender Glenn Rule (left) was shown a straight red card on 28 minutes for a rash challenge. The Blues were made to pay for it as Chris Dagnall added his second of the night minutes later. He went on to complete his hat-trick in the second half that saw The Blues concede four goals in eleven minutes. “Glenn made a rash tackle, but whether it merited a straight red card I’m not sure, but it was then difficult from that point on because Rochdale passed the ball well. Going down to ten men so early was always going to make life difficult. Maybe Glenn was a little bit naive, but he was probably trying to do as best as he could, and he'll gain experience from his mistake, but it obviously hurt on the night.” said manager Simon Davies. The games come thick and fast this month. On Saturday City make the long trip to Kent to face ninth placed Gillingham and follow that up next Tuesday night with a home match against high-flying Brentford at Deva Stadium, the Bees currently lie second in League Two. Defender Shaun Kelly (left), who had to be replaced after 35 minutes on Sunday with a back injury, is a doubt for tonight’s League Two match at Rochdale. Full back James Vaughan is available again after suspension and is expected to reclaim his place in the starting X1. Laurence Wilson and Richie Partridge are both still ruled out through injury. City manager Simon Davies will be expecting his side to reproduce their second-half display from the weekend’s 2-1 defeat for the full 90 minutes tonight. Dale currently lie four points above Chester midway down the table with two wins, a draw and two defeats at Spotland this season. The draw for the first round of the FA Cup will take place live on ITV1 at 13:00hrs this Sunday 26 October. A well-taken goal by Ryan Lowe (left) five minutes from time proved too little too late for City who crashed to their third home defeat of the season at the hands of Port Vale yesterday. After a lackluster disjointed opening half City were a transformed side after the interval, but having already conceded in the first period were guilty of missed chances and were made to pay by a vale side who added a second against the run of play twelve minutes from time. Striker Eddie Johnson made his debut for City and with James Vaughan suspended youngster Glenn Rule made his first appearance of the season at right back. And it was Johnson who missed the golden opportunity on what was an otherwise good debut as he blazed the ball over an open goal from ten yards following up after Lowe had hit the post in the 46th minute. City have to pick themselves up quickly, they’re back in League Two action on Tuesday night when they travel to Spotland to play 12th placed Rochdale. Defender Shaun Kelly must be a doubt after hobbling off in the first half yesterday. Goals from Ben Jones and Lloyd Ellams brough the first League victory of the season on Saturday for the youth team as they defeated Shrewsbury Town 2-0 at home. City manager Simon Davies will have up to four additional players vying for a place in the City squad to face Port Vale on Sunday. Wayne Allison, Eddie Jonson, Glenn Rule and Andy Mitchell all signed contracts this week and are available. The players most likely to feature are Chester-born Johnson who could find himself in attack while defender Rule may deputise for the suspended James Vaughan at right back. Richie Partridge and Laurence Wilson are both expected to be sidelined through injury. Chester, who have picked up draws in four of their last five matches will be looking for maximum points for only the third time this season to lift them to the middle of League Two. The Valiants, who sit one place above City on goal difference, are under new management with the appointment of Dean Glover last week. His first game in charge saw a surprising and dramatic last minute 2-1 win at Shrewsbury Town last Saturday to bring to an end a run of six successive defeats. A large away following from the Potteries is expected for the game on Sunday which has a 12:00 kick-off time and is NOT all-ticket for home fans who should pay on the gate as normal. Assistant manager Wayne Allison, who celebrates his 40th birthday today, has been offered a playing contract at Chester. The forward, who played his last league game in February is currently short of match fitness and it remains to be seen whether he makes the squad for Sunday’s visit of Port Vale. It was a busy day at Deva Stadium as the club also handed a two year contract to Chester-born Eddie Johnson. The 24-year-old has been training with Chester since being released by Bradford City in the summer. To complete the day of action the club also handed one year professional contracts to Andy Mitchell and Glenn Rule. Both have come through the youth team ranks at Chester and made appearances for the first team last season. The youth team have been given a home first round tie against Leeds United in this season’s competition. The match will be played at Deva Stadium on Tuesday 4 November with a 19:00hrs kick-off time. Striker Paul Taylor is to be given a third and final disciplinary warning from the club. It appears that the forward, signed on loan from Vauxhall Motors, has been missing training sessions and on Saturday morning pulled out of the match at Chesterfield saying he was unwell. The same situation occurred at the away match last month at Grimsby Town. Chester signed the Vauxhall Motors 20-year-old striker on a six month loan deal on 1 July. The move could become permanent during January transfer window. The club bid £50,000 for the ex-Manchester City trainee in the January transfer window which was turned down at the time. City made a fresh five figure bid at the end of last season and after a long period of negotiations, involving the players agent, the two clubs agreed the deal. If you would like to ask Simon Davies a question for his weekly Chester Standard/Leader video interview email them to digitalnews@nwn.co.uk. As many of your questions will be put to the Chester City manager as possible. Please include your name and general area that you are from. The youth team were beaten 1-0 at home by Hartlepool United in the first round of the Youth Alliance Cup on Saturday afternoon. Damien Mozika is struggling to be fit for tomorrow’s visit to Saltergate as City look for their first win in five matches against a Chesterfield side who sit one point above the Blues. French midfielder Mozika has been a revelation since signing for the Blues in the summer but is struggling with a groin injury picked up in Tuesday’s defeat against Morecambe. Should Mozika miss out then Anthony Barry would step into the role following a good midweek performance against the Shrimps. Richie Partridge is also doubtful with a hamstring injury ahead of tomorrow’s clash paving the way for a starting place for either Ryan Lowe or Paul Taylor who both came off the substitute’s bench on Tuesday. Tomorrow will see a first return to the Spireites for assistant manager Wayne ‘The Chief’ Allison. 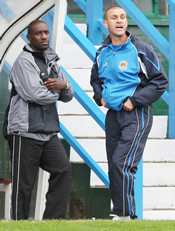 He left the Derbyshire club in February after coaching the reserve team following four years spent playing in the first team. During that period he scored 24 goals in 76+53 appearances. Chester are giving a trial to Hyde United goalkeeper Craig Dootson. The club currently have no back up for first team ‘keeper John Danby and a good showing from Dootson may earn him the role. City crashed out of the Johnstone’s Paint Trophy against Morecambe last night on penalties after the two sides had drawn 1-1 after 90 minutes. The visitors, who were far the better outfit in the opening period, took a deserved lead through Rene Howe just before half-time. Twenty minutes from time manager Simon Davies elected to send on Ryan Lowe and Paul Taylor and City began to push the ball round better and created chances. They equalised eight minutes from time through Kevin Ellison. With no extra time in the competition the tie went straight to penalties but Anthony Barry, Kevin Roberts and Paul Taylor all saw spot-kicks saved by Barry Roche in the Shrimps goal. 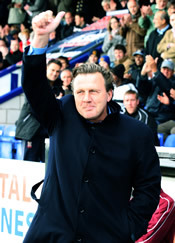 Only Lowe managed to convert his effort for Chester. Steward Drummond saw his kick saved by John Danby but Morecambe converted the rest of their chances to progress to the area quarter-finals. Picture © Evening Leader Former Chester player Peter Jackson (left) made a happy return to Deva Stadium on Saturday as he saw his side record their first away victory of the season 2-0 against a City side who looked anything but play-off hopefuls. The Blues, unbeaten in five matches, turned in a below par performance and were punished for slack defending either side of the break by the Imps. Davies will be looking for his team to return to form tomorrow night when they entertain Morecambe in the second round of the Johnstone’s Paint Trophy. The Blues received a bye to this stage. Admission prices have been dropped for the tie which will be settled on the night and kick-off earlier than usual at 19:00hrs. Admission prices are: adult £10.00, accompanied children are free. Juniors under-16 who attend the game unaccompanied, and senior citizens, will be charged £5.00. The youth team remain next to bottom of the Youth Alliance North West Conference league after a 5-3 defeat at Port Vale on Saturday. City entertain Lincoln City in a League Two clash at Deva Stadium tomorrow, kick-off 15:00hrs. Blues manager Simon Davies must do without Kevin Roberts who serves a one match ban after receiving a red card, for a second bookable offence, in last Saturday’s 1-1 draw at Luton Town. Davies though will be hoping to recall defender Laurence Wilson who appears to have recovered from a hamstring injury picked up in the recent draw with Shrewsbury Town. Lincoln, managed by former City favourite Peter Jackson, will be without without midfielder Stefan Oakes and defender Frank Sinclair for the match. They have yet to win on their league travels so far this season picking up just one point from 12 available. Jackson, who was diagnosed with throat cancer last year, had now on the road to a full recovery and is looking forward to revisiting his former club where he played in the mid 1990s and meeting up with assistant manager Wayne Allison, a player he has signed in the past. Simon Davies’ weekly online video interview with the Evening Leader can be viewed here. If you would like to ask Simon Davies a question in the weekly Chester Standard/Leader video interview email them to digitalnews@nwn.co.uk. As many of your questions will be put to the Chester City manager as possible. Please include your name and general area that you are from. In an effort to increase the number of youngsters attending games, the club have reduced the junior admission charges for the Harry McNally Terrace until the end of the season from £10.00 to £5.00. The cost of entry had increased during the summer. Supporters with season tickets will be given a free match programme for each game they attend and will be offered a free season ticket next season.